A vintage car’s value depends not only on the model but also on its condition. Car restoration for these types of vehicles requires a lot of time looking for parts and a lot of taste and aesthetic ideas to bring back its natural beauty. A majority of the car’s interiors have to do with the upholstery and choosing the right material and pattern to go with a classic beauty is part of the restoration process. Custom auto upholstery is already a given for vintage cars since measurements are, more or less, not within the usual range of “default” upholsteries. Furthermore, since vintage car restoration is more of a personalized hobby, the owner’s taste is almost always reflected on the choice of auto upholstery. From white leather to animal prints, custom auto upholstery shops are ready to provide you with the covers you want for your vintage car’s interior. Material- Car interiors are usually the most abused parts of your vehicle. People come in and go, your children probably has been playing with loose strings and peeling parts of your seat covers. These things happen when you choose poor quality of materials for your auto upholstery. When choosing a fabric for your car seats, one of the most suggested material is leather. Not only is it easy to clean, but also fits any weather. Style- Custom upholstery is changing your car interiors in a way that fits your taste and shows your personality. However, some people over decorate their vehicles that it sometimes look uncomfortable. Remember that car interiors have limitations too. Make sure that it is enough to make you and your family at ease during travel and that will not cost you much during repairs. It is just enough to change your seat covers once in a while, as long as maintaining is not a problem with you. Shop- Of course, choosing the right people to do your seat cover and other auto upholstery is the most challenging task. Reducing the budget and still maintaining the quality of service are the things you look for in a shop. Feel free to inquire about the best options in choosing right car interiors that will fit your pocket’s worth. 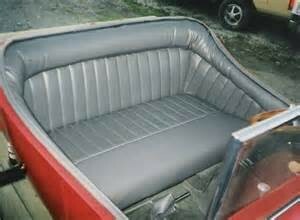 Scrooging on a vintage car’s upholstery is like using plastic lawn furniture for a mansion. Remember that investing on good, quality materials and having the right custom upholstery shop to do it are the keys to getting a classic car looking and working well, inside and out.